Posted on Mon, Apr 9, 2012 : 10:56 a.m. 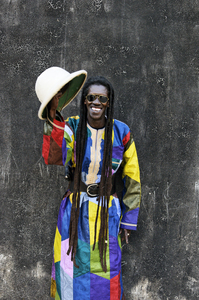 The Senegalese artist Cheikh Lo has been described as a “maverick” of African music, due to his pursuit of a singular style that, while it draws generously on the mblanx style—a popular one in Senegal—it also mixes in various other African forms, as well as flamenco, Cuban son, Brazilian music and American funk. Lo, who comes to the Michigan Theater with his band on Friday for a show sponsored by the University Musical Society, is also versatile: He plays drums as well as guitar. And his soaring vocals have earned the praise of no less an Afro-pop icon than Youssou N’Dour, who has produced a couple of Lo’s albums and recruited Lo to sing back-up vocals on one of his own albums. Lo’s music—and life—are dedicated to Baye Fall, a uniquely Senegalese form of Islam, and part of the larger Islamic brotherhood of Mouridism—which was formed at the end of the 19th century as an opposition French colonialism. Mouridism was founded by Cheikh Ahmadou Bamba M’Becke, and many of Lo’s songs have detailed Bamba’s struggles with the French authorities, who feared that the spread of Mouridism would lead to armed insurrection by the Senegalese people. One of the signatures of the Baye Fall sect is that its practitioners wear patchwork clothes and long dreadlocks, and Lo, now 57, still follows that tradition. Lo’s parents were Senegalese, but he was actually born in Bobo Dioulasso, Burkina Faso, not far from the Malian border. So, he grew up speaking three languages—Bambara (the language of Mali), Wolof (the language of Senegal), and French. The seductive sounds of African music lured Lo at an early age—as a child, he would run away from school to teach himself guitar and percussion on instruments he would borrow from local musicians. Who: Senegalese artist who dedicates much of his music to Baye Fall, a uniquely Senegalese form of Islam. What: A singular musical style that draws generously on the mblanx style but also mixes in various other African forms, as well as flamenco, Cuban son, Brazilian music and American funk. Where: Michigan Theater, 603 E. Liberty St. When: Friday, April 13, 8 p.m.
How much: $18 - $42. Buy tickets by calling 734-764-2538 or online at ums.org. As a teen, Lo absorbed some key influences—the popular Congolese Rumba and Cuban music, which was also all the rage in West Africa at the time. Lo's first professional gigs, starting when he was 21, consisted of playing percussion with Orchestra Volta Jazz in Bobo Dioulasso. It was a good preparation for his later eclecticism, as the band played a range of styles, including the music of Burkina Faso and its neighboring countries, as well Cuban and other Latin forms. Lo is also well-traveled. In the early 1980s, Lo moved to Dakar, Senegal, where he got a gig playing drums for the high-profile, progressive-minded singer Ouza, before hooking up with the house band at the Hotel Savana, for whom he played drums and sang songs drawing from a wide-ranging international repertoire. His next stop, in the mid-‘80s, was Paris, where he worked as a studio session drummer, playing mostly Congolese and Cameroonian music. When he returned to Senegal, the Hotel Savana took a dim view of his flowing dreads—so he began working on his own music. Lo’s first release was a cassette titled “Dosandeme” (“Immigrants”) that explored the experiences of being a Senegalese living abroad. It did well in his homeland, and got him enough attention for him to secure funds for his first “proper” album, “Ne La Thiass,” which he began working on in ’91, but wasn’t released until ’96. That’s one that was co-produced by N’Dour. N’Dour lent his own vocals to a few tracks, and the final product was a semi-acoustic, Spanish-inflected variation on the popular mbalax style. It was a big success in Senegal, and earned him a big audience there. And, so, Lo was on his way. In ‘97 he was awarded Best Newcomer at the Kora All-African Awards in South Africa, and in ’98 he toured the US, as part of the Africa-FÃªte lineup that included Salif Keita and Papa Wemba. In ‘99 he received the prestigious Ordre National de Merite de LÃ©on from the President of Senegal. He recorded three more albums between 2000 and 2006—the discs that found him incorporating sounds from Burkina Faso and Mali as well as the Cuban son and Brazilian styles. Then, for a few years, he retreated from the international scene and focused on performing in Dakar. His few years spent back home clearly influenced the sound of his latest disc, “Jamm,” released in 2010. That disc was a return to his roots in that it was a semi-acoustic mix of West and Central African, Cuban and flamenco styles. "I wanted to look in the rearview mirror with this album," Lo told The Guardian of London. "And when I looked, I saw a beautiful past. I first sang in public in 1975 so there's a lot of nostalgia in this record. I wanted to go back and see what I had done in my life." One of things he has done was to convince the Senegalese that this new, hybridized style would reach an audience. "Every time I made a new album," Lo told the Guardian, "Senegalese people came to my studio to listen and said, 'Yes, but Cheikh, that music won't work here.' They all said I should play mbalax. I would say, 'It might not work here, but it might work elsewhere.'" Kevin Ransom, a free-lance writer who covers music for AnnArbor.com, can be reached at KevinRansom10@aol.com. Mon, Apr 9, 2012 : 3:42 p.m.